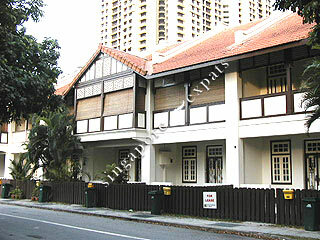 Townerville - A popular clustered townhouse located at Towner Road, just outside the city. The whole development is originally built in the early nineteenth century and is later conserved and upgraded in 1992. Each heritage house has solid teak flooring on the second floor. There are balcony or open terrace in most units. The living and dining rooms are located on the first floor and the bedrooms on the second floor. Townerville is a 2 minutes drive to Newton and Novena subways and 5 minutes drive to Suntec City. The new Boon Keng MRT is only a 5 minutes walk away. This means you can go anywhere in Singapore via the subway.